Luxurious Oceanfront Villa Bel Ha, an exclusive beachfront vacation home is located on a private estate in Xpu-ha, 1 hour south of Cancun. 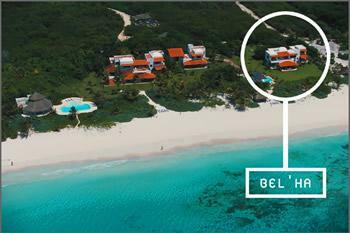 The luxurious villa offers tranquil elegance on considerably the finest beach in the Riviera Maya. Fashionably furnished with pristine whites and contrasting mahogany woodwork, the villa exudes excellence and relaxation to fulfill your dream vacation. The outstanding villa has 4 suites offering private bath and terrace or balcony on which to absorb the tranquility of the pristine surroundings. With extensive dining options from ocean front palapa to poolside and jungle terrace areas, you will have many choices in which to enjoy the Caribbean atmosphere. A full time staff of 5 including a cook, housekeeper, 2 butlers and a gardener will ensure that you are truly pampered! Surrounded by natural flora and fauna, this idyllic spot in paradise is bathed in natural light with extensive views of the tropical garden, turquoise ocean and powdery white sands. 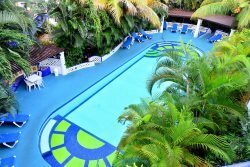 The lush tropical gardens are enhanced with illumination by night and grounds are complete with a natural cenote pool. An endless list of activities is available due to the perfect location of this unrivaled paradise, including snorkeling, scuba diving, horseback riding, fishing, golf and the list just continues....Of course the spectacular Mayan ruins are within easy driving distance.